In the midst of summer, the scorching sun has given birth to a new golden mount! From a far and forgotten land, one of the greatest mythical beasts in Sapphire has arrived in League of Angels II. 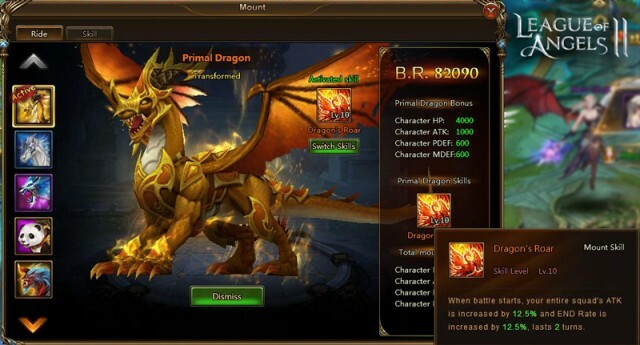 Introducing the Primal Dragon, a truly magnificent mount clad in shining golden armor. But a dragon is no house pet, and only the greatest of champions can control it’s will. Are you worthy enough to be a dragonrider? Primal Dragon’s presence alone will strike fear into your enemies, but there is so much more to this ancient beast. Players that can obtain the Primal Dragon will receive a significant boost to their character’s attributes (base bonus: HP+4000, ATK+1000, PDEF+600, MDEF+600, AGI+150). In addition, Primal Dragon’s unique skill Dragon’s Roar will buff the attack and tenacity of the entire squad at the start of battle, providing the perfect combination of offense and defensive for a well-balanced squad. After this comprehensive look at the Primal Dragon, are you excited to have your own dragon in LoA2? Participate in the Lucky Tree event from July 23rd through July 25th for the opportunity to claim Primal Dragon for yourself! Enjoy a brand new Mount, more Outfits to choose from, and rewarding events this summer! Do not let this chance slip away!